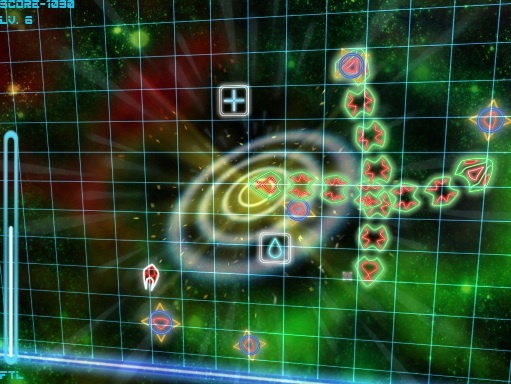 Hyperlight is a cross between Geometry Wars and Tilt to Live. 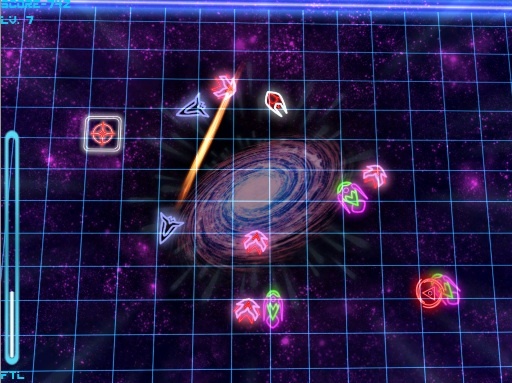 You maneuver a tiny spaceship across a grid, skillfully dodging a variety of enemies, but you can fight back using faster than light (FTL) travel and power-ups. Factor in tight controls and sharp neon graphics, and you have a leading candidate for App Store game of the year. This is essentially a game of retreat and attack. Enemies appear and then approach from all sides, and you get out of harm's way while gathering FTL pickups to fill a gauge. Once it has energy (even the slightest bit), you quickly tilt the device of choice to achieve a speed boost that essentially lets you plow through aliens until the aforementioned gauge empties. It's the perfect form of revenge for the 20 or more creeps on your tail. As we mentioned, though, the game's power-ups also prove effective, and there's a satisfying mix of weapons, including one that absorbs nearby enemies and another that grants you an FTL boost that lasts considerably longer than usual. Even better, the developers supply a wealth of pick-ups, so you'll always have something nearby. At first, the concept of tilting to control the ship seemed ridiculous and the cause of many cheap deaths, but CatfishBlues Games deserves praise for its mastery of both the iPhone and iPad. Regardless of which control type you choose (with the device laid flat or slightly tilted), guiding the spacecraft through a sea of critters is a breeze, to the point that we're able to thread the needle through tight spaces and even form near perfect circles around bad guys. We also dig the two modes, both of which offer a somewhat unique experience. The first, Infinite, lets you destroy stuff without interruption, while the second, Arcade, features levels and eight boss fights. The only downside? The latter features cornball music that would be an ideal fit for a NASCAR game, and the menu jingle sounds like something one would hear while on hold. Finally, there's the FTL attack. Even the slightest movement activates it, which leads to an unintended loss of valuable energy. These issues aside, Hyperlight is surprisingly enjoyable, to the point that we have trouble putting down the iPad. Factor in Game Center support, complete with leaderboards, and this is one of the most addictive games we've had the privilege of playing. What's Hot: Super addictive, excellent tilt controls, Game Center support, universal download, only $1.99, sharp neon graphics. What's Not: Arcade mode has terrible music, cheesy announcer.